Only the MTV VMAs could get Simone Biles, Kim Kardashian, Britney Spears and more in the same room. While viewers at home had prime view of the stage on Sunday night, the A-list audience and backstage shenanigans told a different story than the glossy, high-production performances. Simone Biles achieved her goal of meeting Kim K. -- and snapped a selfie for posterity. 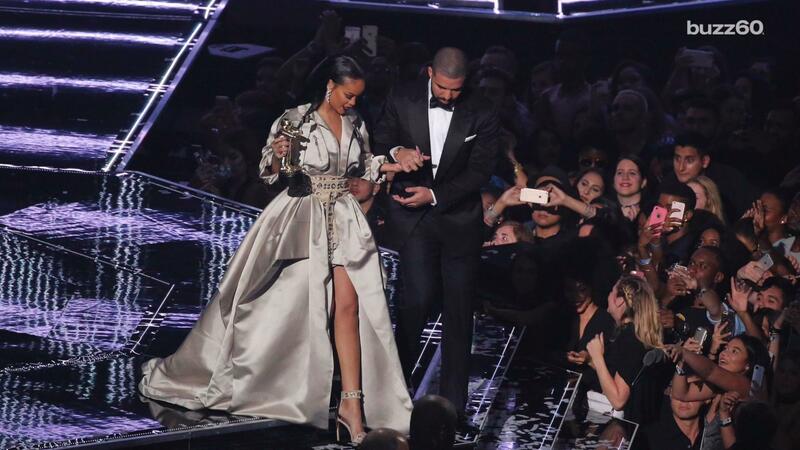 Another one of the most buzzed-about moments of the night was when Drake professed his love to Rihanna onstage. After the show, the rapper shared a glimpse of how the adorable duo celebrated Rihanna's big night. In the pic, Rihanna is sipping on a glass of wine as her beau kisses her on the cheek on a rooftop in NYC. "This is a night for us all to be thankful for what you have done for us! You have affected so many of our lives in the best way possible. Tonight we celebrate you!" Drake captioned the PDA-filled snap. See these snaps and more in the slideshow below. WE THE BEST!!!!!!!!!!!!! @djkhaled @alessiasmusic. Tune into the #VMAs and the pre-show tonight!!! !